To keep global warming in check, the world will have to invest an average of around $3 trillion a year over the next three decades in transforming its energy supply systems, a new United Nations climate science report says. It won’t be cheap, but it’s also a change that’s already underway . . . Corporate giants including Google and Apple, for example, purchase enough renewable energy to cover 100 percent of their power needs. The research and sustainability advocacy group Ceres has been working with companies and large investors for years to help them understand both the risks to their portfolios from high-carbon sources and the opportunities of investing in cleaner infrastructure as renewable energy prices fall. Ceres argued in a report released earlier this year that achieving a “clean trillion” in additional annual investment in clean energy and infrastructure is “eminently feasible.” Read more here. The Corporate Renewable Energy Buyers’ Principles and the Business Renewables Center are the core initiatives of the Renewable Energy Buyers Alliance (REBA). REBA helps companies understand the benefits of transitioning to renewables, connecting large buyer demand to renewable energy supply, and helping utilities better understand and serve the needs of all energy buyers. RE100 is a collaborative, global initiative uniting influential businesses committed to 100% renewable electricity, working to massively increase demand for – and delivery of – renewable energy. A growing number of RE100 businesses are also helping their suppliers access renewable energy for their own operations, exponentially contributing to global wind and solar energy deployment. RE100 is sponsored by The Climate Group in partnership with CDP. Both organizations are part of the We Mean Business coalition, working with leading businesses around the world. Over 100 cities have committed to 100% renewable energy in Sierra Club’s Ready for 100 initiative. The Sierra Club, founded in 1892, has 3.5 million members and supporters nationwide. 2018 Case Studies Reports featuring 10 new cities that are ready for 100% clean energy! The Billion Dollar Green Challenge encourages colleges, universities, and other nonprofit institutions to invest a combined total of one billion dollars in self-managed “green revolving funds.” The Sustainable Endowments Institute launched The Challenge in 2011. Download a brief summary that explains The Billion Dollar Green Challenge, including partners and funders. Currently celebrating their 47th year, the Interfaith Center on Corporate Responsibility (ICCR) pioneered the use of shareholder advocacy to press companies on environmental, social, and governance issues. This coalition of over 300 global institutional investors currently represents more than $400 billion in managed assets. Leveraging their equity ownership in some of the world’s largest and most powerful companies, ICCR members regularly engage management to identify and mitigate social and environmental risks resulting from corporate operations and policies. The Shine Campaign is a new, global campaign blending communities of faith, philanthropy and finance to solve energy poverty. 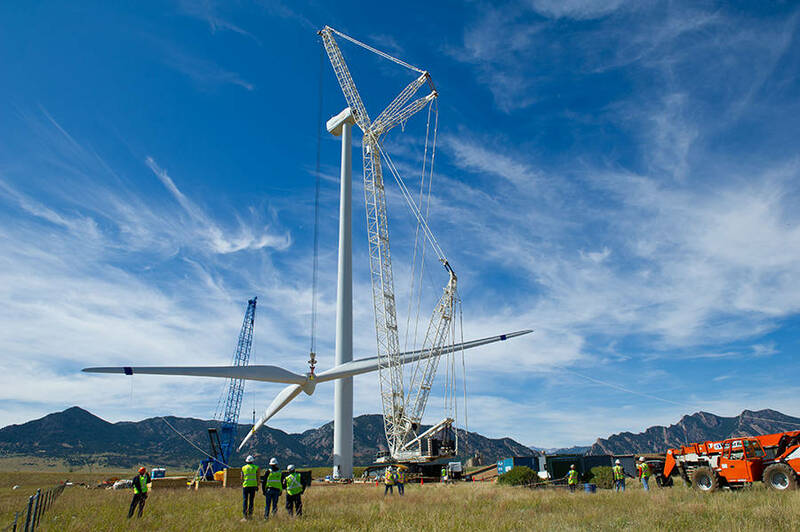 This entry was posted in NewsBlog and tagged Business Renewables Center - Rocky Mountain Institute, CDP, Ceres, Corporate Renewable Energy Buyers' Principles, RE100, Renewable Energy Buyers Alliance (REBA), The Climate Group, We Mean Business on October 11, 2018 by Helen Deffenbacher. America’s technology corporate giants have led the corporate renewables procurement trend, but two of the biggest names in tech just reached a new mark: Apple and Google are now both 100% powered by renewable energy . . . This trend is opening up new markets for renewable energy, leading corporate suppliers to decarbonize, and saving money on corporate bottom lines – and it isn’t slowing down anytime soon. Read more here. The Corporate Renewable Energy Buyers’ Principles and the Business Renewables Center, which Silvio Marcacci references, are the core initiatives of the Renewable Energy Buyers Alliance, or REBA. The alliance’s goal is to help US corporations procure renewable energy to meet their needs. 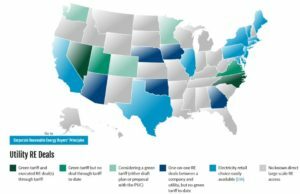 U.S. Renewable Energy Map: Click map to link to it. RE100 is a collaborative, global initiative uniting more than 100 influential businesses committed to 100% renewable electricity, working to massively increase demand for – and delivery of – renewable energy. the U.S. renewable energy market with Enel; 10 MW of Nebraska’s Rattlesnake Creek Wind Project will be allocated to Adobe. Facebook announced today their Nebraska data center will be three times the size of its original announcement. The Papillion data center will be six buildings instead of two with groundbreaking set to begin in May on the additional buildings. Facebook announced last April their plan to build its next data center here and credited the development of OPPD’s Rate 261M as one of the biggest draws. Read the entire blog post. Author: Jim Piazza, Director of Data Center Operations, East. Last year, we worked with Omaha Public Power District to create a new renewable energy tariff that ensures we can power our data center with clean and renewable energy. With the tariff in place, we could seek new, in-state wind projects, which we found in Enel Green Power‘s Rattlesnake Creek Wind Project. We will now increase our purchase from 200 MW to 320 MW to support our growth, and we are excited to share that we have partnered with Adobe to help them enter the U.S. renewable energy market with Enel; 10 MW of Rattlesnake Creek will be allocated to Adobe. The new deal between Enel and Facebook widens the scope of the bundled, long-term power purchase agreement for 200 MW signed in November 2017 to gradually include the plant’s overall output by 2029, following Facebook’s decision to significantly expand its data centre in Papillion, around 120 miles from Rattlesnake Creek. The energy produced by the entire wind farm will enable the expanded data centre to be 100% renewable-powered. This entry was posted in Nebraska / Midwest News and tagged Adobe, Apple, CDP, Enel Green Power North America (EGP-NA), Facebook, Facebook's Papillion Data Center, Forbes, Google, Nebraska's Rattlesnake Creek Wind Farm, OPPD The Wire, OPPDs Rate 261M, RE100, The Climate Group, We Mean Business on April 12, 2018 by Helen Deffenbacher.